I have been knitting and crocheting since 2008. So that's nearly 4 years. I forget that I haven't been knitting forever because I jumped into the knitting world with both feet and didn't stop to look. I love learning and knitting became my focus. Crochet got left behind in my passion for knitting and knitting techniques. In a way I was lucky to start my love affair with knitting when I did, because there was a place called Ravelry all ready and waiting for me to join. I got a massive boost in my learning curve from reading forum threads and finding free patterns and tutorials. There were also great blogs and websites with tutorials, and YouTube was full of videos. I feel like I have learnt so much already, but the most important thing I've come to understand is that there is no end to the learning in crafting. You can become a master crafter and still have massive holes in your experience and learning. It's really exciting because I know I'll never reach a limit to what I'm able to discover. Every year I say to myself "I will learn how to do......", and I never do. Usually because something else new and interesting comes up. I've decided to stop setting myself these goals that I never achieve, because it always makes me cross at myself for not getting on with it. I've decided that I will try and find new ways of doing simple things, like casting on, or creating selvedges or doing jogless stripes. I will also try new techniques when I fall in love with a pattern that requires me to learn something. For instance, I really want to learn how to do entrelac, but I have yet to find the perfect pattern that makes me itch to do it. When I find it, I will learn, but I won't spend the time on the technique until I find something that uses it. Mind you, Harlequien from Sweet Shawlettes by Jean Moss is definitely making my fingers twitch. Recently I have found myself wanting to learn more about crochet again. I think it is the birth of new babies in the family. 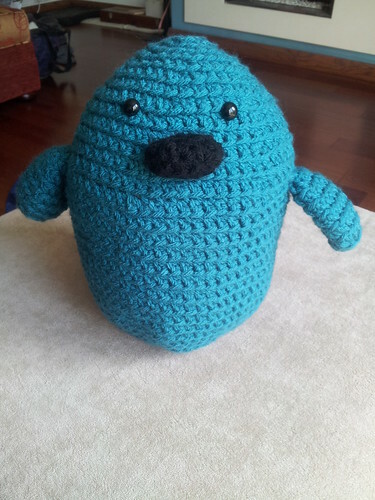 I want to make toys and all the cute ones are crochet! I am enjoying learning more about making 3D forms and I think it will probably lead on to doing more crochet accessories too. I have seen some amazing crochet shawls and would love to have the confidence to try and do them. I think once I have worked my way through my current Craftsy course I will perhaps look for other courses on crochet, to improve my crochet skills. They seem to have atrophied a little during my knitting frenzy of the last 4 years! The Craftsy system of learning seems to suit me well, and it means I don't have to give up on doing courses simply because of my health. I like being able to learn at my own pace in my own home. I have had to give up going to Adult Education classes because I could only manage to attend about half of them. Craftsy have filled a gap the Adult Education courses have left. It is a way of learning in a structured manner from an experienced teacher. I think having some guided learning is a good thing for me. It reduces my normal scatter gun approach. I am hoping to reduce my frantic race to learn everything, that I seem to have adopted. I keep forgetting that I have a lifetime of learning ahead of me. I can take as long as I want to try new skills. I don't have to hurry. I can take my time and enjoy the learning and the practical application of that learning. I think it is time to slow down and just enjoy my crafting for a while, rather than treating it like a university course, that gets marked and analysed! It's time for me to slow down and crochet the roses.